FARMINGDALE, N.Y. — Pete Bezuk wanted to build golf clubs. His first employer, Titleist, sent him to truck-driving school. For a month, he learned how to coax a big rig along seaside cliffs and leafy back roads on the routes to many of America’s most idyllic golf destinations. Typically, he pulls up to the driving range. Then a 42-foot trailer becomes a mobile equipment factory, and for three manic days, he and nine other Titleist technicians cut, bend, hammer, and grind clubs to any taut specification a player might desire. This became Bezuk’s strange life on the PGA Tour. As the golf season winds down with the four-tournament FedEx Cup, beginning with the Barclays tournament, which ends Sunday, here at Bethpage Black, another long year will culminate for the players. It also means the end of a commensurately taxing grind for the support crews that trail the pros at every turn. 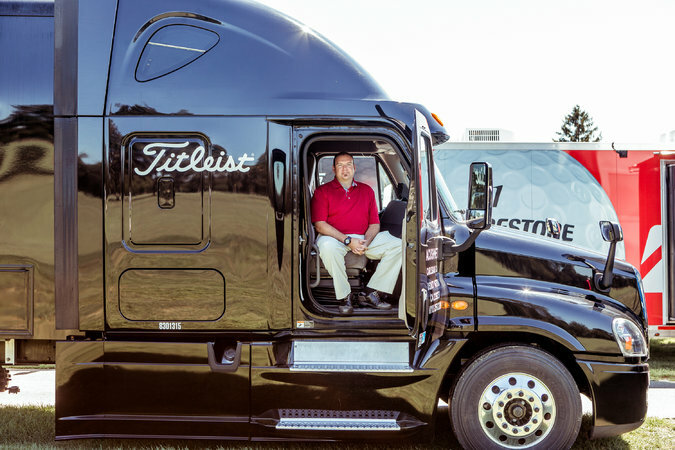 And the biggest among them are 72,000-pound semitrailers, like the ones commissioned by Titleist, TaylorMade, Callaway and nearly a dozen other golf brands, ubiquitously looming in the background for all the tinkerers on tour. Most fans never see them; they usually arrive on Sunday and depart Wednesday afternoon, headed toward the next tournament destination. In between, there is about 45,000 miles of driving per season. Wade Liles, who has handled TaylorMade’s tour truck since 2000, learned to drive it in the company’s parking lot after the company hired him to replace grips on clubs.